We didn’t get up until 8.30 in the morning the day we left Exmouth – it’s exactly a month today before we’re due home in Melbourne and the idea of packing up was depressing. 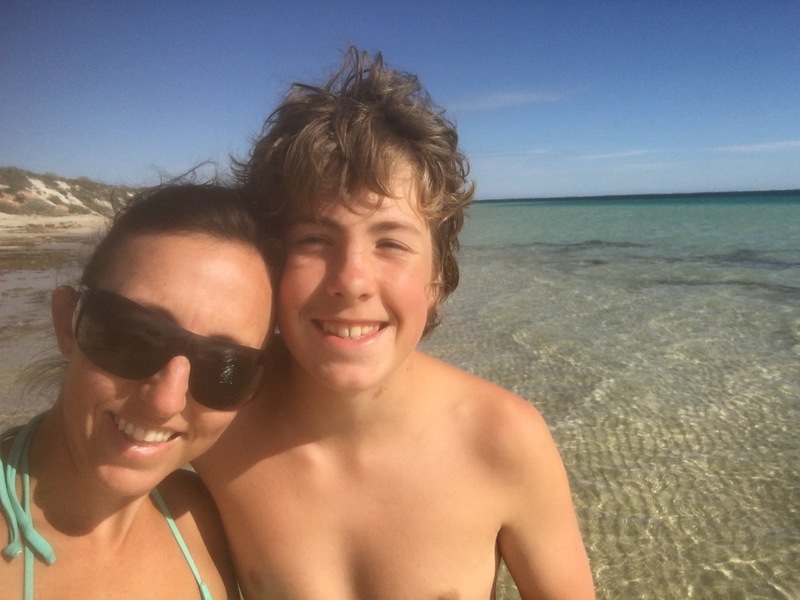 We fuelled up at an out-of-town depot (always cheaper than in town) and got ourselves off to Coral Bay. …A quaint little town consisting basically of two jam-packed caravan parks and a little shopping hub and car park. We had planned to camp the night at a station stay about 40km out of town but after asking at one of the caravan parks we managed to get the last powered site available in a shady spot between two trees. Reception got me to walk over and check that I’d be able to fit between the two trees before they’d let me book and pay – I thought we could’ve parked a semi in that spot – chicks reversing trailers still seems to be a foreign concept for some people. After lunch we headed to the beach with our snorkels and towels. The beach at Coral Bay is devine – soft white sand and crystal clear water for miles around. The sun was shining and I thought we’d check out the coral that Coral Bay is named for. 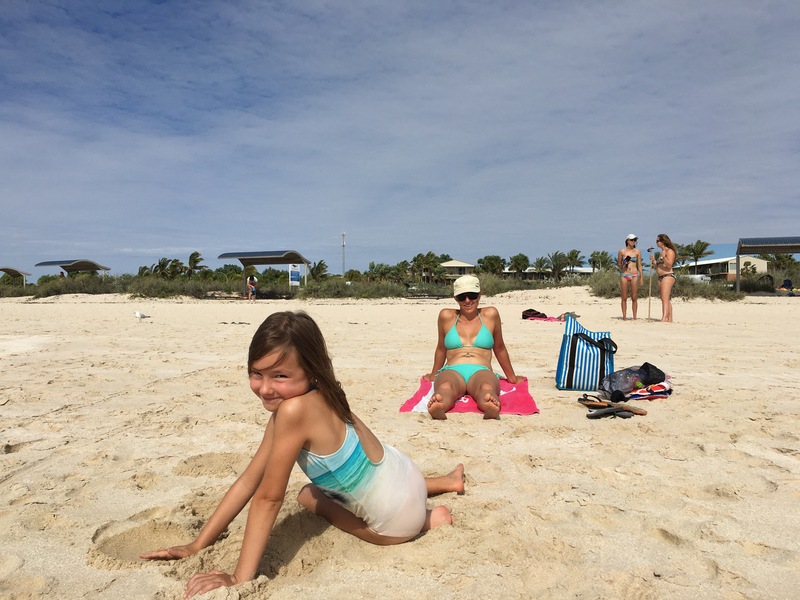 Miss6 didn’t want to snorkel and after five minutes, Master14 had had enough so I had a very quick snorkel fairly close to the shore, stopping to look up and check on the kids on the shore before I gave up and went and sat on the sand in the sun. 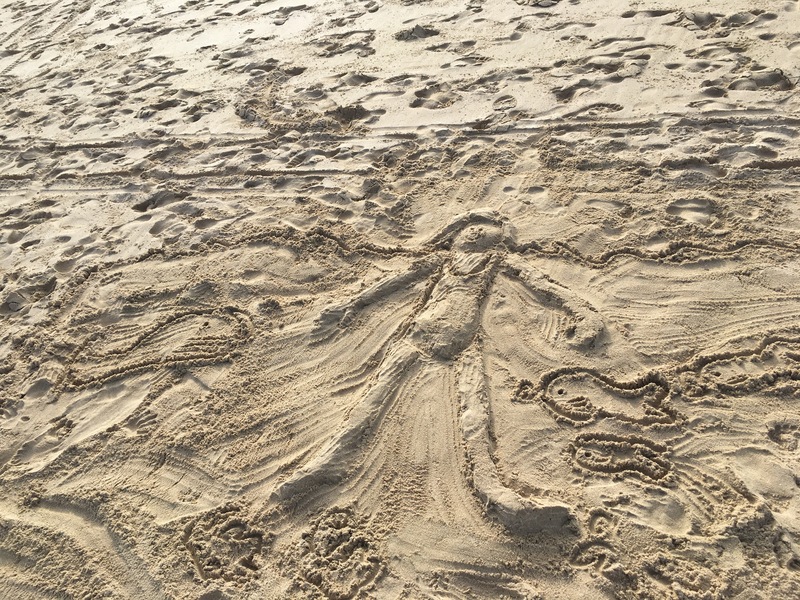 The kids played the afternoon away building sandcastles and 3D sand pictures of themselves. Later that afternoon our KC family friends arrived and we hung out with them, the kids playing on the playground and jumping pillow before we all walked down to the beach to watch the sunset and walk along the beach. 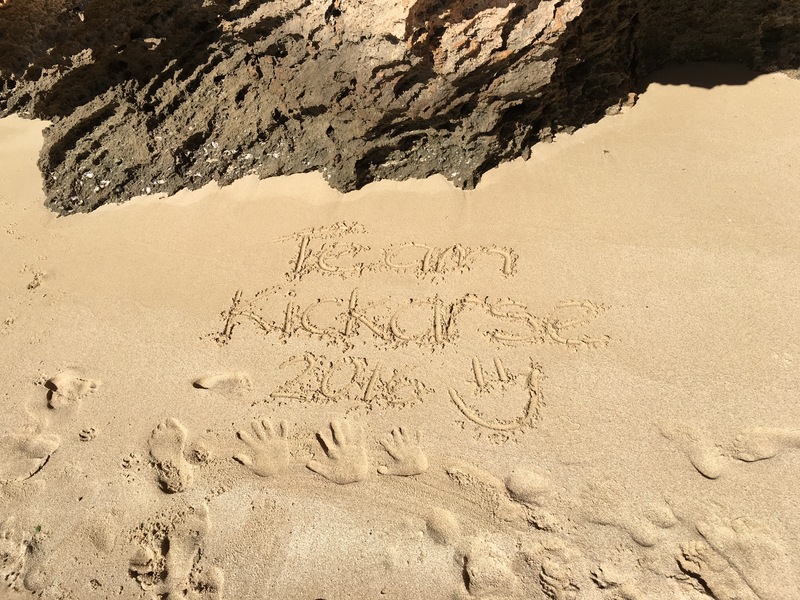 Miss6 wanted to show KC Miss7 her 3D sand scultpure of herself too. We walked back to the caravan park they were staying at and sat together on a picnic table outside of the booking office at their caravan park and ate dinner. We’d ordered pizza from the cafe there as we didn’t have food in the van that was easily packed for a picnic away from the van. The next morning we packed up the van and parked it in the information carpark and walked down to the beach to meet our KC family friends. 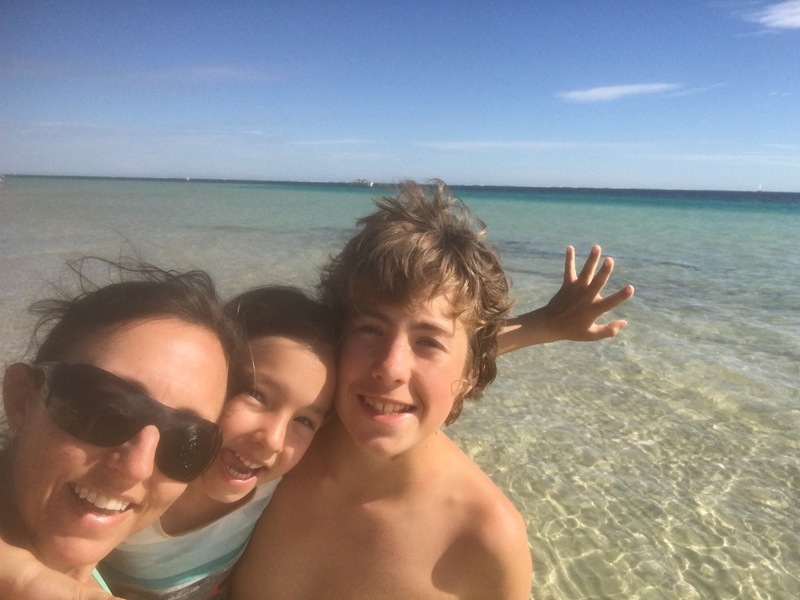 They were heading out for a snorkel so Master14 stayed on the beach with Miss6 and KC Miss7 while the rest of us hit the water and started paddling out in search of some good coral. It wasn’t until we were about 100 metres from shore and looking to line ourselves up with a floating bouy and the nearby wind turbines that I actually realised that KC Mum had been given the secret (not really but it’s not obvious without the local knowledge) location of the large coral formation known as ‘Ayers Rock’. When we finally found it, our lone snorkel expedition had mysteriously turned into a large group with a bunch of other people almost materialising before our very eyes! I’m so glad I went for that snorkel with them, the fish and uniqueness of Ayers Rock were unlike anything I’d seen before. We headed back to shore and I tried to get Miss6 to have a quick snorkel but the coldness of the water put her off and I couldn’t convince her no matter how hard I tried. She was very excited however when a large pelican (an actual pelican not a seagull that she keeps mistakenly calling pelican) started swimming along the shore beside us. The kids followed it for a while marvelling at its unusual head and we took photos of it as it sat perfectly happy so close to all of us in the water. After drying off we headed to the bakery to grab some lunch and started our drive to Quobba. 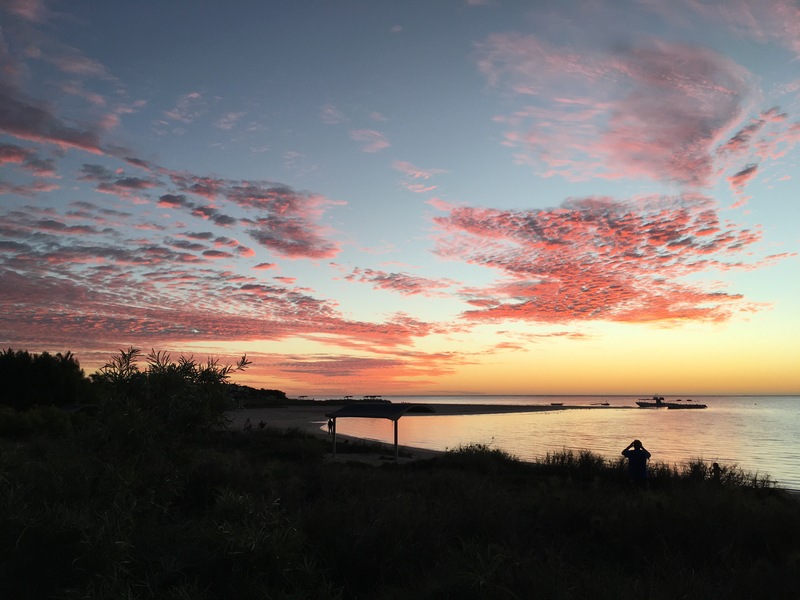 We weren’t sure what to expect from Quobba – I’d been told to stay at Quobba Station but when we arrived we decided to stay at a little Council run park for only $11 per night. We parked the van to unhitch and explore then decided to keep it hitched to save us time in the morning as this was only going to be a one night stopover. 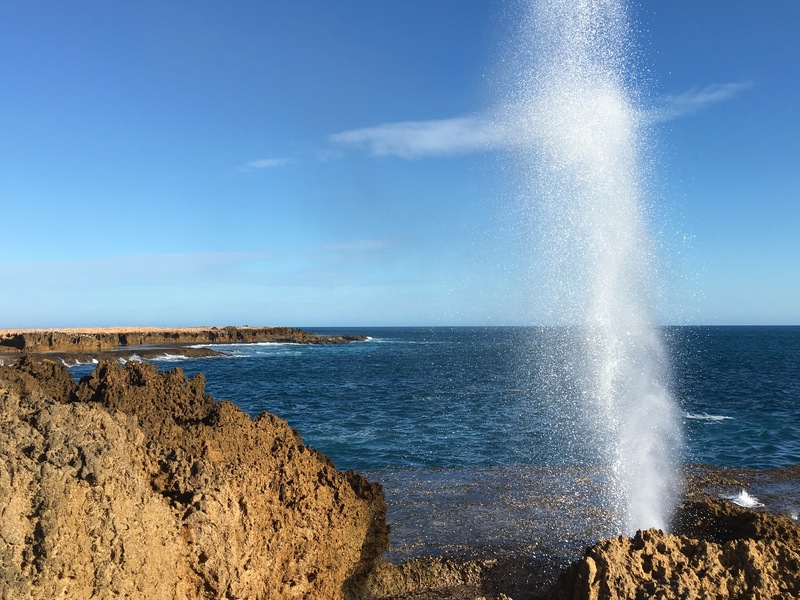 We drove to the blowholes and were blown away by them (pardon the pun). 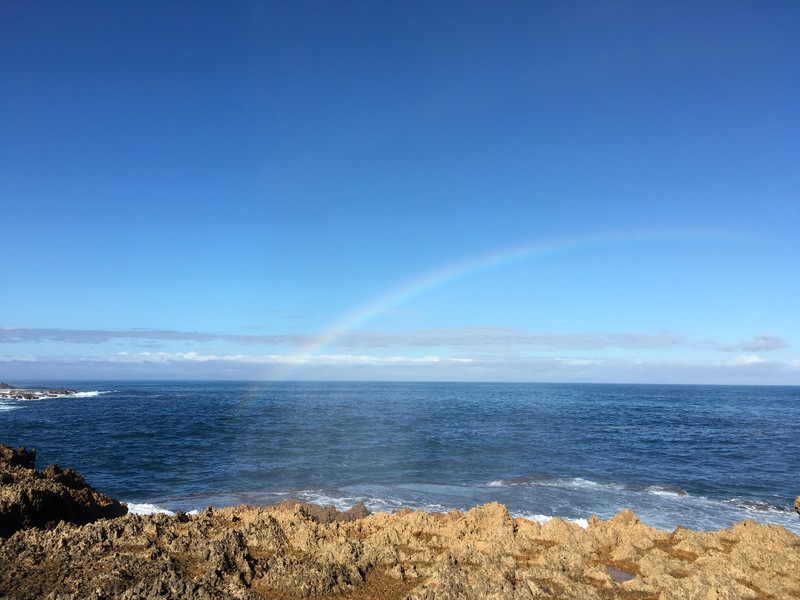 We were lucky enough to be there while there was a good swell and the bursts of water coming from the blowhole were shootinga good 10 metres into the air and forming a rainbow each time they sprayed. Miss6 thought this was awesome and squealed with delight each time a new rainbow was formed. There were a group of Japanese tourists watching the blowholes too and one of them was sitting precariously close to the blowhole getting very wet for the ultimate photo – we weren’t that keen for a photo. We hopped back into the car and after looking up to the hill where the lighthouse stood, I decided against taking the camper up there and went back to the camp area to unhitch the van. 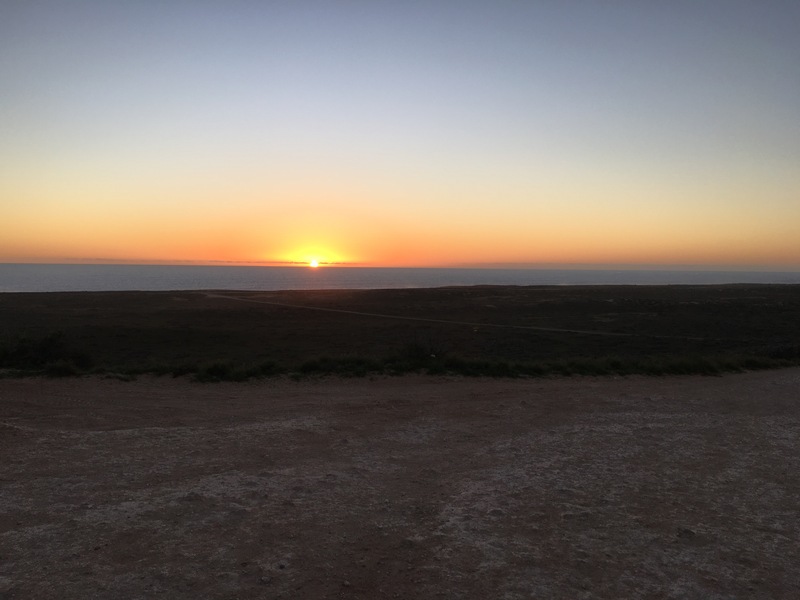 We drove up the road towards Quobba Station to check out the HMAS Sydney memorial and enroute we noticed a few cars pulled over and people looking out to the water with binoculars. We followed their gaze and realised they were watching whales out on the water. We continued to the memorial and from there we not only learnt about the sinking of HMAS Sydney and 645 Australian lives lost, but we could see another whale and its calf frollicking in the water. On the drive back down the road we pulled over in what seemed like a good viewing spot and could see four different whales and their calves swimming and jumping out of the water – it was quite a spectacular sight to see and we were all pretty rapt to be here for it. 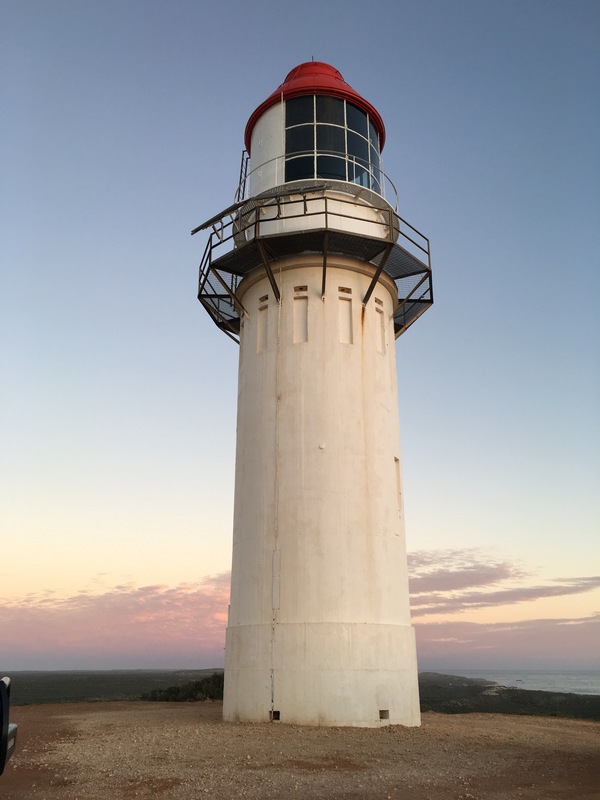 Miss6 tripped over her own feet somehow, walking to have a look and ended up cutting her big toe and splitting her nail so after some hysterical crying and a bandaid we hopped back in the car and headed to the lighthouse. At the top not only were the views spectacular (you could still see some of the whales from up there too) but my phone suddenly beeped and we realised we had some service. There was an older couple already up there plus a mum with her two young kids and Victorian number plates. We started chatting about number plates and the messages that different governments put on them when her husband popped his head from out of the car and I yelled ‘I know you!’. Of all the lighthouses in all the little sea shanty towns in Australia, I bump into a guy I used to work with 15 years ago! We laughed at how unlikely it is to have bumped into each other way out here and before long we’d been invited to their van for dinner (which just so happened to be almost next door to where we’d parked our van). A quick phone call to Nanna in Melbourne to tell her where we were and it was back to camp to set up the camper and join some old (and new) friends for dinner. It was so lovely not only enjoying a meal with someone you know and reminiscing about old times, sharing travelling stories and a nice glass of wine around the fire but also such a treat to be cooked a meal. We were served a delicious dinner and dessert and I did little other than provide a bigger frypan to use and one cold beer – it was a night off and a night out all in one! During our lovely evening together we managed to count over 25 shooting stars in the sky – the visibility and beauty of the night stars in the Australian outback is just divine and we will truly miss the Milky Way and other night-sky delights once we’re back home where street lights replace them. I wish we had more time left up our sleeve to get home, we all would’ve loved to stay here a few extra days and have now added Quobba to our growing list of places to come back to. Our new/old friends were on a similar route and timeline home as us now but with a few days less and a few less destinations on their ‘to visit’ list so were lucky enough to be staying at Quobba for a few nights. The next morning we said goodbye to our friends and hit the road again. Since travelling to Coral Bay and Quobba we’ve swapped termite mounds in our window views for those of the WA wildflowers – mainly just white and yellow but a change in scenery just the same. We’ve also swapped no radio or ABC radio for ‘Classic Hits Triple Six’ (this should be sung in that old 80’s radio ad style and not spoken for the full effect). Off to Mount Augustus today to see what all the fuss is about. Ah yes, “chicks reversng trailer still is a foreign concept” – I get the stares or comments of disbelief often too. On our recent trip, I even got applauded for reversing out of a rugged campsite!